Pull up your scarf and walk hunched into the bitter wind that slices through Asakusa this New Year’s eve. On your way home. You’re feeling less than celebratory. Perhaps it was the mindless crush of Shibuya. Knocks it out of you. Things are better on this side, out east. And maybe they’ll be good this year. 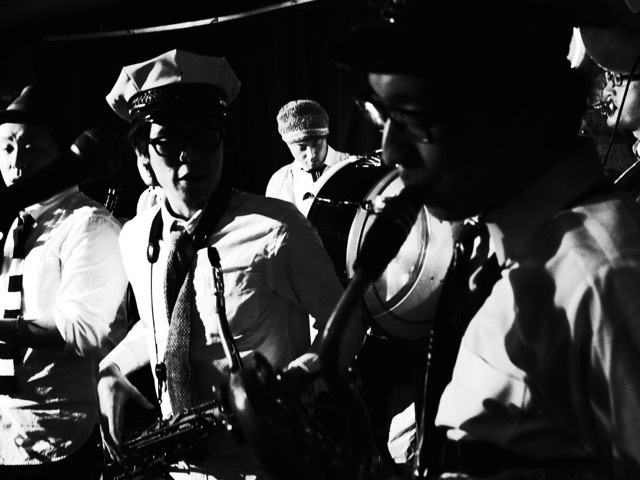 In a lane off Sushi-ya Dori, high-energy jazz leaks out of the Hub. You’ve never been to this British-style tavern with the American music. Dixieland is not really your thing. But tonight seems different. An air of anarchy and incense. The band is mid-flight through a raucous rendition of Duke Ellington’s oriental-ish Caravan, a chugging trombone soloing over jabbering trumpets and sax; two standup drummers pummelling away over sousaphone bass. You listen from the street. The waitress comes out. We’ve got jazz tonight, she says. Well, obviously. She says there are two more sets. One- and two- am. So, why not? The room is full, just smoky enough. The band is hot – loose and tight in the right places. You learn later they are session musos who get together for fun. The One Time Brass Band. There’s one vacant seat at the bar. The band plays a multi-layered arrangement of Happy. A spiffy older couple across the room start dancing and twirling, spritely and taut, showing off. She has a sleek dress with a sort of fur collar, and her hair up. Then between songs, the elderly gentleman on the stool next to you says hello, in halting English. 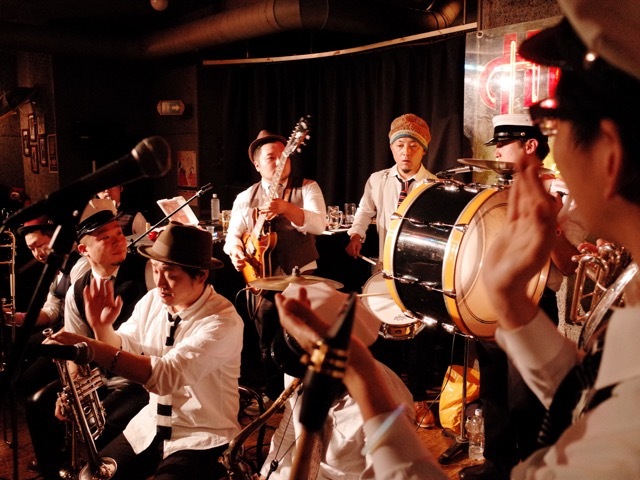 Kenta is a retired gastroenterologist who grew up in Asakusa then moved to Setagaya and now returns to the Hub a few times a month for the jazz. He picks up the monthly gig calendar and circles the shows he’ll be back for. Definitely. One-hundred-percent! Come back then, he tells you. I’ll shout you fried oysters, or tonkatsu or unagi! His wife passed away some years ago. So I am carefree, he says. He goes to an English-language school and visits British mates in places like Bournemouth. He speaks effusively, sipping on his whisky and water. Slaps his forehead when he can’t express something. He apologizes for forgetting words. My brain has … ATROPHY, he says; which rather proves that it doesn’t. If you can have his vocabulary in another language when you’re 73 years old and deep into a bottle of Chivas, you’ll be ok. When you go to leave you find he has paid for you. He won’t hear of you not accepting. I can’t take my money to heaven, he says, waving you away. Here’s to the next countdown.